Ah yes, us homosexually-oriented guys and gals have really arrived, politically speaking that is. And now that we’ve got our great big day in the Western societal sun, boy oh boy, do we intend to take advantage of our newly granted aristocratic status as martyred members of yet another phony victim group, ever eager to mug, manipulate, and weasel our way into as many poor-me privileges and free passes that we can manage to connivingly muster. Two dykes in Colorado have been charged with criminal mischief and bringing false charges for what the local police and the FBI say was the staging of a phony hate crime. Apparently, the two women were in an ongoing battle with their homeowners’ association for failing to clean up after their dog. So in retaliation for their neighbors’ insistence that they pick up their pet’s poop, these ladies of the lesbian persuasion decided to play the hate crime card. 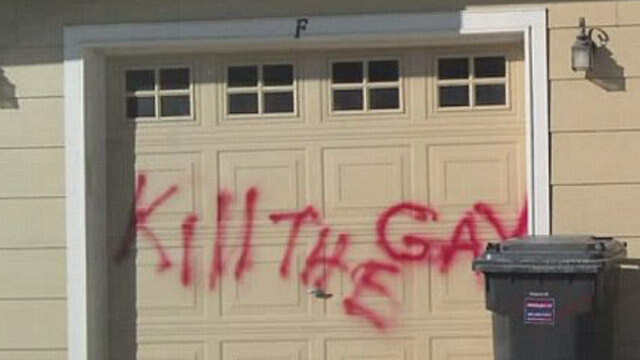 And Abracadabra!—an anti-gay epithet appeared on the couple’s garage door followed by a hangman’s noose left on their front doorknob. Cue the media outrage and we’ve got ourselves a neatly packaged jaded justice extravaganza. The spray painting incident occurred back in October of 2011 and because it was classified as a hate crime, the investigation involved the FBI. The FBI! One can only wonder at the time, money, and resources allocated to what should have been treated as a simple straightforward misdemeanor. But alas, so goeth the Hate Crime Crusade. The couple continue to proclaim their innocence, although a third woman, a roommate who lived with this dynamic duo, informed the FBI that the dykes did the deed themselves. The women were also tested for spray paint residue (results not released) and asked to take lie detector tests which they both refused to do. For the full story and a video clip featuring one of the lesbians bull-dyking, (sorry, couldn’t resist), bulldozing her way through all the accusations for the benefit of the camera, click on the link. This entry was posted in Lesbian/Gay, Political/Social and tagged Colorado, dykes, FBI, hate crime, lesbians. Bookmark the permalink. I don’t want to be offensive, but isn’t “dyke” considered derogatory? Or is it like “queer” in that it was formerly derogatory and is now a word that lesbians have embraced? And am I, as someone who is not a lesbian, allowed to use it? I really hate political correctness. There are so many rules that don’t make any sense whatsoever, and I might be forced to attend “sensivity training” or something if I break them. Well, for decades there have been Dyke Marches around the country as part of gay pride stuff and lots of so-called lesbian literature over the years has reclaimed the D word as part of the lesbian empowerment movement. Certainly in the 80s and into the 90s, the dyke word was very much In. It’s obviously used derogatorily at times by straights, I guess to denote some type of brutish male persona. And it’s certainly used in a derogatory fashion by gay men at times. Whatever the motivation though, I could care less–that kind of silly nastiness doesn’t touch me in the least. Some dykes don’t like the word at all, feeling it’s low class, meaning working class. But then again, there are lesbians who won’t use the L word to describe themselves, falling back on the ‘gay’ descriptor. I use all three interchangeably. In our great gay rights world of the 21st century where we have become so mainstreamed, I especially like to use the dyke word as a way of knocking the smug, self-satisfied stuffing out of a lesbian community that in many ways has forgotten its very roots. I would not be offended by your use of ‘dyke’ here at TLC. As always, it’s the context that serves up the meaning of any communication. Other gay women though might not feel this way and would automatically assume that the D word coming from a male was a sign of definite disrespect if not outright hostility. So it’s very much a mixed bag. Hope this answers your questions somewhat. This sickens me to the core.. I can’t stand it.. and no wonder why some people spit at lesbians and gays, I believe after this fad of being gay is said and done with, i think that straight people and gay conservatives will hate them even more.. shame shame! Notice the so-called mainstream media hasn’t bothered to mention this news story. Doesn’t fit their narrative. This really ticks me off. Not only is Colorado FULL of dogs, but full of dykes with dogs. Undisciplined dogs. These two gems live 30 miles away, but it’s still an embarrassment. Many lesbians look and behave like the very people they oppose; red neck men. They tend to look like slobs, or as if they just stepped out of the garden after a day of planting, raking and gettin’ down in the mud. Neck tattoos and ink in general seem to be popular with them; rough and tough. They scare me.